My stomach lurches. My back is dripping with sweat. I lunge after Evan time and time again to make sure he does not run down the aisle of the theater. I hold his hand and let him lead me to the lobby doors. He loudly shouts, light! light! light! and insists on getting to the “light.” Against my better judgement, I take him into the brightly sun lit lobby and let him run around, making sure he doesn’t touch the trash can, go up the steps, touch the other patrons, run out the front door, you name it. I feel my lip trembling and the warmth of tears touching the corners of my eyes. I feel jealous of the other parents sitting in the theater with their child who is happily watching the show. I then feel guilty for feeling jealous. This is his field trip, and not only that, but it is a live musical performance. I had been incredibly excited for this day, to share something I love with my son who has an uncanny connection to music. I was SURE he would love the experience. I hear familiar music ringing in the background. A song Evan knows! I was sure he would be happy if he heard the music, I was sure I could sit back down in the seats and join his class for the last five minutes. I tried to sit, and E crawled up my chest, and tried to get away from me yet again. He carried on loudly, protesting and wriggling all over our laps. Todd leaned over and said that we might as well leave, since it was almost over anyway and Evan clearly did not want to be in the seats. We were fighting a losing battle. We scrambled to gather up our things and get out of there with some sense of dignity. The parents, teachers, and children from E’s school watched the show intently, with popcorn bags and drinks in their laps. His car seat buckled, his bags strewn about the back of the van. I had to go to work to get in a half day and Todd was bringing him home. I kissed Evan goodbye and felt my eyes film over. Todd asked if I was okay but I couldn’t muster the words. I realized that my reaction didn’t seem to match what had happened. Evan is a two and half year old. Two year olds don’t necessarily want to sit for any length of time. Why did this hurt so much? I walked through the stinging cold wind and felt my cheeks burn. My stomach was tied in knots. All I wanted to do was sit alone and cry. It had been a while since I felt that way. Since I felt like we were outsiders. There was a sea of happy, healthy children who could watch a show, communicate their needs clearly, and be engaged. And Evan was hanging out in the baby pool, splashing about, not caring if he was a part of the sea or not. My friend came over with her son over the holidays. Her son is only a few months older than Evan. They are buddies. We shared pregnancy adventures, new mom doubts, laughs, and tears. She is one of my dearest friends. While our boys were infants, her son would achieve milestones months and months before Evan. It made sense at the time because he is ten weeks older. I never worried or focused on it. I remember thinking, Evan would get there in his own time. After receiving E’s diagnosis, the gaps became wider. Well…actually they always were wide, I just accepted that they would not close in like I had thought they would. Her son is extremely verbal, always chatting,using multi-syllabic words, complex sentences. He tries to talk to Evan and Evan bounces happily in front of him, gazing at his buddy with awe and love. He often will try to say something, but it comes out more like a babble because he is so excited. I love having them together, since they have known each other since they were in our bellies. But I would be lying if I said it doesn’t put me right back to the baby pool-big sea situation sometimes. I watch Evan do his own thing, happily splashing away, unaware of any development gap or difference. Repeating a string of sayings over and over again. “Here we go!” “All aboard!” “Light on?” I love hearing our little guy talk. It’s just a little different when you have an example of age appropriate speech right in front of you. My friend’s son uses interjections, adjectives, a rich vocabulary. I could listen to him talk for hours. I videotaped him counting a long time ago when I was babysitting him because I found it amazing to hear him count. Evan is using two word combinations, and he only really adds on the word please to make the second word. And who cares, right? Certainly not Evan. E happily splashes in his baby pool. His smile does not fade when another child expresses his or her need more clearly than him. He does not notice that he is wearing orthotics and still using a wider gait and walking on his tip toes. He does not mind that the children at school are sitting in their chairs without any straps and buckles and he is strapped into a booster seat to sit at the table. He does not catch the second glance the mom in line gives him and me when I say he is 2.5 and he is shouting vowel sounds in the line at Target. Evan loves the baby pool. He loves when others allow him to enjoy the baby pool. He also loves when you jump in with him. Play with him on his level, see the water through his eyes. When he is allowed to push buttons for a little while. Allowed to shout church hymns at the top of his lungs in the grocery store. (only his mama knows they are actual songs) Allowed to turn on and off the light switch a few times every time you enter the room. Allowed to chase the stroller so he can spin the wheels for a little while. When I was a little girl, I could spend hours in the baby pool by myself. Splashing around, using my imagination to pretend I was floating in the ocean, that I was a mermaid waiting to be rescued. It’s not a bad place to spend some time. If Evan doesn’t mind it, there is no reason why I should be concerned. Doesn’t mean he won’t still receive swimming lessons or that he will not be asked to try out the deep end at some point. But for now, the baby pool is just right for him. Scrolling back through pictures of Evan in his first year, my heart hurts a little. It hurts for a number of reasons. It hurts because I can see the features that indicated he had Williams Syndrome. The blue sparkly eyes, the wide and flat nasal bridge. The memory of his floppy limbs. At the time I had no idea. Evan was over a year before we received his diagnosis. I’m sure some of you are thinking, “what does it matter now?” Truly, it doesn’t. And 92% of time, (I did extensive research to get that percentage) I do not look at the words Williams Syndrome and feel anything negative. In fact, most of the time I see it as a true gift. That my son has this rare condition that causes him to have extreme empathy and compassion. It causes him to smile all day long. It causes him to sing at the top of his long and care very little who hears it. I can drop him off at preschool and there is no crying. He toddles away from me happily and forgets I’m there. It hurts because I see my father’s rosy cheeks and ear to ear grin in Evan’s chubby baby face. It hurts because I can remember the difficult time I had post-partum and how I longed to see the beauty in motherhood. It hurts because I know my little boy is growing up. I know he will enter the public school system soon. That our first meeting with the child study team in our school district is just days away. It hurts as I recall the first time Evan was evaluated by the early intervention team. How my stomach lurched each time they asked Evan to complete a task and he would just look at them expectantly, hoping they would play with him but not completing the expected task. Not knowing that he was being tested. Then the hurt turns to a knot in my stomach. A knot of joy intertwined with struggle, intertwined with pride, intertwined with wonder. My, how far Evan has come. From this little floppy baby who could stare at a spinning wheel for a half hour straight. From this bouncing bean who loved to leap in his jumper exersaucer. From this eager boy who wanted to communicate with us so badly but could barely get out the word “more” for the longest time. This past weekend, I woke up late (glorious glorious thing that was) at my in laws house to find everyone else up and playing in their living room. Evan saw me, stopped the game he was playing, smiled a huge smile, came over and sat in my lap. He gazed up at me and just very confidently said, “Mama.” First time ever. Not the first time he said “Mama,” but the first time he spontaneously did so, without anyone pointing at me or prompting him. I can remember months and months ago saying to a friend, “I just can’t wait until he greets me and says my name in excitement.” It happened!! My Christmas gift has already been unwrapped. And it’s a gift i can unwrap every day. So blessed. Well….I did it. We did it. We made it through week one of Project Return to Work. The last day I taught in a classroom setting was in April of 2011. I was 9 months pregnant and incredibly eager to meet my son and become a mother. I can honestly say I had NO CLUE what the next two years would bring. I didn’t know the excruciating pain of labor. I didn’t know the extreme joy of holding my first born child after carrying him around for ten months and five days. I didn’t know the turmoil that sleep deprivation can do to your emotions and your psyche. 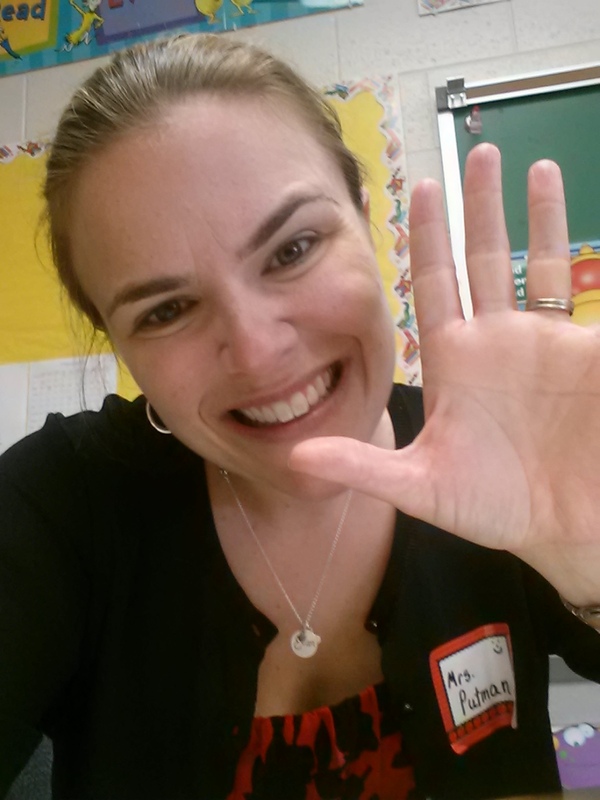 Saying hi from my classroom. I didn’t know much I would need and love having my mother in law stay with us when I struggled with anxiety and insomnia in the months after giving birth. I didn’t know that being a mother is not necessarily an inherent skill you are born with. It takes work and experience just like any other job. I didn’t know that I would miss getting dressed for work in the morning and the adult conversations that go along with having a job outside of the house. I didn’t know how guilty I would feel for missing those things. I didn’t know how much guilt stinks. I didn’t know how being a SAHM sometimes feels like high school all over again, with the mommy cliques and the comparison conversations that go on at the playground and indoor play facilities. I didn’t know how much richer my relationship with my mother would be through becoming a mother myself. I didn’t know how important it would be to make sure to have a child free conversation with Todd every day. I didn’t know how hard it would be to leave Evan with a babysitter. We still have not “hired” someone outside of our circle of family members and friends. I didn’t know how exhilarating it would be to have a baby free dinner with Todd. I didn’t know we would find out our child has a rare genetic condition. I didn’t know how life changing a moment in a doctor’s office could be. I didn’t know how hard it would be to be around my friend’s children for a while. I didn’t know how desperately I would try to find a reason to believe the doctor might be wrong. I didn’t know that one day I would realize my child was going to change people’s lives. For the better. I didn’t know how music would bring so much joy to our child. I didn’t know that I would end up taking an additional year off and have no regrets. I didn’t know how I would go from wanting to work, to not wanting to work, to needing to go back to work and all the emotions that go along with it. I didn’t know the power of online communities. I didn’t know I would make lifelong friends on a support board. I didn’t know I would wear a Williams Syndrome awareness tee shirt to the store and hope that someone would ask me about it. I didn’t know how the half hour after nap time would become my most favorite time with Evan. I didn’t know how important early intervention is. I didn’t know how much I would value Evan’s therapists. I didn’t know how hard it would be miss some of Evan’s therapy sessions because of work. Again, I didn’t know how much guilt can really stink. I didn’t know how hard working moms work. I didn’t know how hard stay at home moms work. I didn’t know conflicted I would feel about being both of those things. I didn’t know how hard it would be to give up the amount of control I have over Evan’s life. I didn’t realize how much I value being in control. 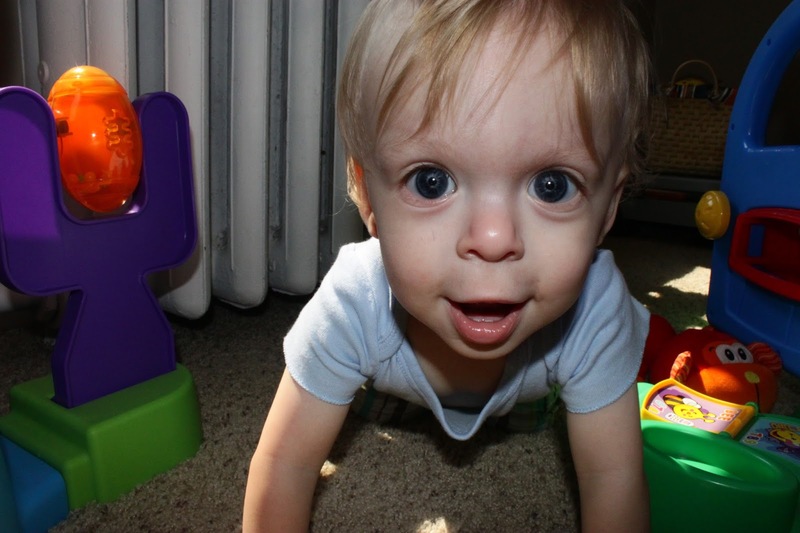 I didn’t know how two big blue eyes could just fill up my heart and tear up my insides all at the same time. I didn’t realize how blessed I was, and would continue to be. I thought it was a good time to share some of my favorite blog entries that I have read over the past month or two. I have become engrossed in the blog world and I have learned so much from other bloggers. It seems fitting that every few months I share what I have found amusing, educational, touching, you name it. Enjoy! Be sure to leave supportive comments on the blogs and tell them I sent ya! 1.) Love That Max: Getting Sucked into Special Needs Parent Self Pity I just love Ellen, the author of this blog. She writes with humor, honesty, and a lot of very helpful knowledge. This particular entry reminded me that we are all human, and it’s okay to have pity pot moments, but we just have to make sure not to stay there. 2.) Star in her Eyes: You’d Never Know. This eloquent blogger has two beautiful daughers. One has a rare condition called Wolf-Hirschhorn Syndrome. She blogs about life with her first daughter and beyond. This entry really hits home for me, she discusses the way that people often address her after finding out that Fiona has a genetic condition. That she “looks normal.” Such a harmless phrase, but it can mean something very different to a mama of a child with special needs. 3.) Andrew Solomon’s Ted Talk: This is not a blog per se, but a 20 min talk that hit me so hard. Just really made me think about acceptance, differences, prejudice, how I treat and look at others. Do yourself a favor and carve out some time to watch it. 4.) Brewing And Chewing: Big Brother Motives. The husbo wrote a really great piece that somehow ties together the reality T.V. show, Big Brother, the 2004 Indian Ocean tsunami, and Williams Syndrome. He truly has a brilliant mind, that is not just the wife speaking. 5.) Williams Syndrome Smile: In Love. This is written by a friend of mine. Her daughter has WS and had major heart surgery in May. This entry just makes my heart full, as she discusses her love for her daughter and how it has changed into something amazing. What would I do for my son in a heartbeat? I would jump in front of a car. I would plunge into deep water. I would give him water, drink, shelter before I would give it to myself. I would take him to numerous doctor’s appointments. I would check on him every night, putting my hand on his back gently, just to make sure he was breathing easily. I would go home early from events to make sure he gets to bed at a reasonable hour. I would wear sweet potato and Pediasure stains on my shirt like a badge of honor. I would hold up an Octopus and make him sing and talk 23 times in a row, because Evan is using his way of communicating to request that. I would stand behind him on every piece of playground equipment because he just isn’t ready to be on them independently yet. I would listen to him bounce in his crib so hard that it shakes the floor boards. I would spend his “nap” time watching him do raspberries, shout and bounce in our video monitor. I would put pieces of french toast onto his high chair tray, one at a time, so that he has the chance to demonstrate good oral motor skills while eating, even if it means a meal takes about an hour at a time. Do you know what I would not do in a heartbeat? I would not take away his Williams Syndrome. To be honest, I probably would have, if you had asked me a year ago. I was still so angry that my child was going to face extra obstacles for the rest of his life. I was angry that even though I love my students with special needs (and always have), I did not sign up to have one at home. But, time changes a LOT. I have talked to other mothers about this topic. And some disagree. Some admit they would take away the disability in a heartbeat. I completely respect and understand that. It pains me to imagine Evan being bullied. To imagine him sitting in a classroom, trying to do the appropriate thing, but struggling to figure it out. It is hard to have him play with his age appropriate peers and watch them speak with ease to each other while Evan bounces and holds onto a chair, excited to communicate with them but unable to in a clear fashion. I am sure you have heard about the scientific advances in chromosomal therapy in regards to Downs Syndrome. Here is an article that sums it up. It is a very tough issue to consider. I can totally see both sides of the issue. But for me, when I think of Evan, and I think of the completely fictional idea (for now) that something could be done to “correct” his genetic condition, I would not want to do that. Evan is who he is, and part of what makes him Evan is his genetic code. I would not want to change that for the world. He stared at me today for about 12 minutes straight while I sang three rounds of a church hymn that he loves. He would not take his eyes off of me. His little soul is just so beautiful and I know that if he were to have the missing genetic material, he would not be the Evan we have grown to love so much. Just like if you were to take away the genetic information that makes me overly sensitive, prone to gain weight easily, and clumsy as all get out- I would not be Erin. I just wouldn’t. Clearly this is just my opinion, my experience, my son. I would not change who he is. We have a TWO year old. Two years. Two years that have come and gone in so many ways. Painstakingly slow when we were going on two hours of sleep a night for months, And warp speed fast, when days are spent playing in the sand, watching Evan learn to walk, snuggling before and after nap time, and knowing my days at home with him full time are numbered. But either way, we made it! We more than made it. We have a happy, healthy, thriving two year old. Last year at this time, we were just finding out about Evan’s diagnosis. We were just being hit with the news that would change so many things for us. We had a huge party for Evan that was on the same day as his baptism. It was a crazy idea, to have over 50 people over our house, just an hour after we returned from church (in Philly). But we wanted to celebrate two big occasion and we wanted to share in it with loved ones. Two days before the party we were told that Evan might have Williams Syndrome, but we needed to go to a geneticist to make sure. Todd and I handled that weekend differently, I was convinced he was fine, he did not have the condition, the doctor had made a mistaken assumption. Todd had done the same research I had, but his logic took over and he knew deep down that our little guy was missing some genes. Either way, we both were overcome with emotions, worry, confusion. The party is a bit of a blur for me. I do remember that Evan was not himself. He was extremely tired from church that morning, and all the attention. He took a nap, and when he woke up, he was groggy and his reflux was acting up terribly. He just wasn’t his chipper, social self. We had not discovered his high calcium yet, so we were continuing to push high calcium foods and drink in him, which was exacerbating the gastrointestinal issues he was having. I remember taking pictures of him with his cake in front of him and he would gag when he looked at it, and when we tried to give him a small piece, he pushed it away and gagged again. At that time, most gags came right before a vomit, so we didn’t push it. I didn’t let on, but it was breaking my heart that our little guy couldn’t enjoy his birthday treat. Such a silly thing. When I thought about being a mom, I figured I would have to limit his sugar intake, try to cut down on sweets. And there I was, crying inside about the fact that my son couldn’t eat his birthday cake. In the months to follow, as we got Evan the care he needed, the early intervention therapies, the appointments, the correct amount of calcium in his diet, etc, he began to handle food better, and keep it down with more ease. But I never would have imagined what would occur just a year from that party where he gagged over a few crumbs. I watched him as he picked up the fondant tire off the top of his cupcake, and then try to put it back on the top multiple times. We took the tire away, because I don’t think he realized it was edible. He then began to touch the cupcake with curiosity. We give him such small pieces of food typically bc the speech therapist is working on age appropriate feeding patterns with him and the bigger the piece, the sloppier he gets. Makes sense. We have a TWO year old. A brave, hard working, sunshine-of-our-days two year old. Dripping with chocolate cupcake crumbs. In fact, I’m very okay with that. Today is May 1, the first day of a whole month dedicated to spreading awareness about Williams Syndrome, the condition our little dude has. It is the most amazing compilation of experts, parents, and individuals with WS. It is hard to believe that a year ago, we were struggling with figuring out what was causing Evan to regurgitate almost everything he drank or ate. We were going back and forth from the GI doctor, to the pediatrician, to the feeding team, where we ultimately began down the road of discovery and acceptance that our son did not just have run of the mill reflux issues and some minor developmental delays. Instead we learned he was born with a rare genetic condition. Something that was determined at conception, before we even met our son. Relive that experience here. Last summer, I was in a much different place. I had trouble going on the Williams Syndrome Association website. Trouble looking at all the pictures. Seeing how similar Evan looked to all the children. Reading how Evan’s development mirrored those of other children with WS. Worrying about the future. Wishing Evan would have those 20-30 missing genes so he would be okay. So we would be okay. My, the difference a year makes. We are just over 11 months from the day we found out and I have a much different outlook. Don’t get me wrong, life is not roses and sunshine every day. But as I have said so many times, that is true for anyone, not just for my family. I have gained so much more than I ever could imagine. I ended up deciding to stay home a second year with Evan, and that has been incredible. It has taught me so much about who I am as a mother. Who I am as a person. I have gained many new friends. Some who I have had the pleasure of meeting in person, and some who I talk to more often than my own husband through the beauty of technology. These women are amazing. And to say that we are connected is an understatement. We just “get” each other. And thank goodness for that. The WSA website is now a godsend. I use it often and I use it as a resource for others as well. I have learned to be okay with not only being a teacher of children with special needs but to be a parent of a child with special needs. I have been given the very kind compliment several times, “God knew what he was doing when He blessed you and Todd with Evan.” It may be cliche, but it is totally the other way around. We are the lucky ones. Hands down. Just spend ten minutes with Evan. Two minutes, even. You will see why. This month of awareness is important. It is important because the more people know of this rare condition, the more research will be done, the more parents will know what to look for, the more people will be more accepting of “invisible” disabilities. Of course these are just hopes of mine, but I am so darn proud of Evan and I am not afraid to shout it from the rooftops. I think there is a little spark in our guy. A spark that hinders him from walking on time, or using his consonants correctly. A spark that causes him to enjoy bouncing, rocking, and moving constantly. A spark that engages you immediately. A spark that draws you in like a moth to a flame. A spark that causes his eyes to sparkle like the Fourth of July. A spark that cause you to tear up when he accomplishes something new. I can only pray that his spark will continue to burn brightly. That it will carry him through life with that smile, that love for interaction. For today I cannot worry about the possible bullies, the search for acceptance. We will face that as it comes. For today I celebrate our son. Today I celebrate all individuals born with Williams Syndrome. And I hope that you will too, by educating yourself and sharing with others. Do me a favor, Watch that video. Share it with your friends. Consider donating to the WSA. Look with kinder eyes on the individual with a disability when they walk by you in the store. Practice humanity. Our little guy thanks you. Written on August 29th, 2012 for a feature on the awesome Pickled Bean.